Patrons of local cafés and pubs got quite the shock this afternoon when local tweaker and small-fry crook, Leon Torsik, destroyed a hefty portion of downtown. Torsik appeared to display powers akin to telekinesis, an ability this reporter has witnessed under the control of Martian Manhunter. Unlike our trusty alien superhero, however, Torsik seemed unable to control his anger while he tore through the city, slurring and shouting incomprehensibly. Luckily, and in typical timely fashion, Superman arrived on the scene. The Man of Steel attempted to subdue Torsik through dialogue, but the savage Torsik became more enraged nearly crushing two paramedics with their own ambulance. Unmoved by the extreme show of force, Superman again tried to calm Torsik, only to have the peculiarly powerful Torsik toss him several yards through the wall of Shalvey's Pub. Things got worse as it appeared Torsik's rampage cracked open a gas main which soon erupted in a bursting fireball that spread through the block. Superman, of course, was only momentarily phased by the explosion and soon swooped down into the blaze. It isn't clear what exactly happened next as Superman and Torsik weren't visible from within the inferno, but the fire dissipated soon after. In the smoldering rubble, Superman held Torsik's dead body. I was able to grab a quick word with Superman later and asked him what had happened. "Torsik just died," he said. "I can't explain it." When I pushed the question of whether drugs were involved, Superman had this to say: "I found something similar to methamphetamine on Mr. Torsik's body. It's possible this substance was what caused his psychotic break. Maybe even his sudden powers." I hoped to get more information from Superman, but he kindly declined, insisting he had to assist with the clean-up. Of note, several witnesses said they saw superstar industrialist Lex Luthor near the scene. I tried to reach Mr. Luthor's office for an interview, but was declined. Later, Mr. Luthor's office released an official statement addressing his concern over the damage to the city and the citizens that were hurt. It appears Mr. Luthor will donate two million dollars to reconstruction efforts. Story - 4: Finally, it arrived! 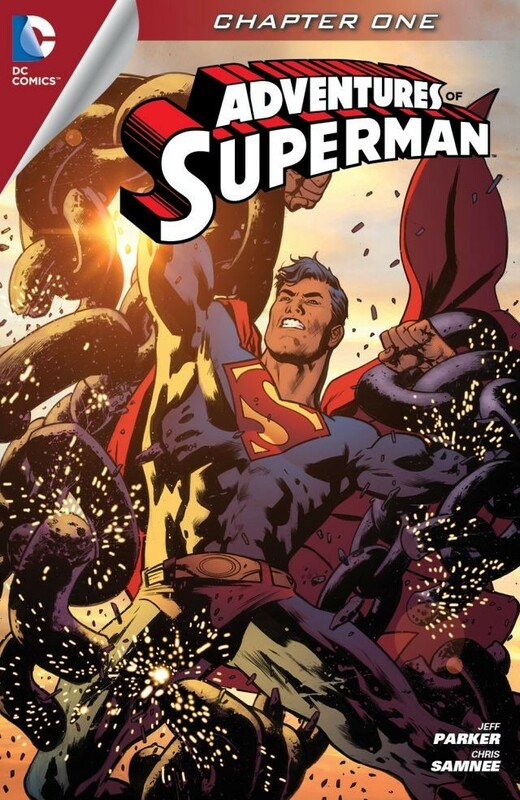 There's a lot of comic book stuff coming this year for Superman's 75th, and although I'm excited for Scott Snyder and Jim Lee's Unchained and Greg Pak and Jae Lee's Batman/Superman, no new title has held my anticipation more than Adventures of Superman. Amid early controversy, the title had some hurdles to leap over - tall building-sized hurdles. I'm not going to address that controversy, but I would like to say that if any reader has lingering doubt or bad thoughts about the title because of the controversy, you can put them at ease. This debut issue was a booming, bursting, blazing bombshell! There are few off points, like the boozehound and the bartender showing passing interest in the giant Superman-shaped hole in the wall of the pub. Breaking that down, it's rather good tongue-in-cheek, but the dialogue deadens the delivery. A huge 'wow-point' for me came on the first panel of page ten (digital edition): Superman punching himself in the face. Square in the nose! You don't see that every month! If you haven't read the issue yet, I won't spoil this moment with the how, though you may be able to guess why/how it happens by the content of the story synopsis. Where this story ultimately delivers is in the fun factor. It's just a blast to read. On top of that, there's this pitiful anti-villain in Leon Torsik whose death, and the reason for it, genuinely pile on the sympathy. He's a victim, and you're excused for being mad as a hockey dad when the full details of Leon's sad tale come into full light. Growing out of this, we see a devious Lex Luthor, behind the scenes, in complete control, planning the demise of a none-the-wiser Man of Steel. In all that, Parker has delivered a top shelf story. A final word on Superman himself. Parker seems to have put a lot of care into Superman, even though the entire story is less than fifty panels. There's a lot of wind that blows around about "the real Superman." It's all subjective noise, really, but I believe that the Superman that Parker has presented here is one we can all enjoy. Art - 5: Samnee. That should be an adjective in contemporary comic book art. "Man, your art is really samnee!" This would mean, of course, that the art is excellent. 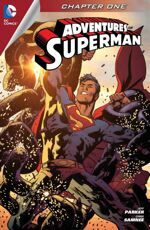 Most of Samnee's work is over at Marvel, with a particular nod to Mark Waid's awesome Daredevil, so it's nice to see him doing some work with DC, and even nicer that it's on Superman. Samnee is able to detail weight with minimal lines bringing an almost audible quality to his art. The nods to Shuster and Swan seem obvious, and with Wilson's beautiful muted hues accentuating the details, Adventures of Superman #1 looks a lot like its ancestors six or seven decades back. Many readers will be happy that the "classic" suit is shown here. Honestly, I find the complaints about the absence of the shorts to be cosmetic, and the story itself is not made better, nor the art more presentable because Superman is wearing the old suit. A last word for the art team: Wes Abbott has done some outstanding lettering on this issue. Particularly with Torsik, the lettering is grimy and is strewn within the bubbles. Brilliant. Cover Art - 4: This may be a rather typical cover, but it looks remarkable. Bryan Hitch and David Baron have recreated one of the most iconic Superman poses and made it modern with clean, sharp lines and sizzling lighting. This is a poster I'd like on my wall.